Hepatitis C virus (HCV) infection is a major health problem. This viral infection is related to several serious clinical complications. About 2.2% of the world’s population is infected with HCV, most infected are asymptomatic and unconscious of their condition. Genetically, HCV can be classified into seven distinct types (genotypes). Knowledge of the different genotypes is relevant to vaccine development, management of chronic HCV infection, and development of specific national treatment strategies. Illicit drug use is a main risk factor for transmission of HCV. The behavior of illicit drug users (DUs) may increase the risk of viral infections through the choice of drug, the frequency of use, and the sharing of equipment, as well as unprotected sexual activity, multiple sexual partners, and prostitution. A number of studies indicate that DUs have played a key role in the worldwide dissemination of HCV. Fig. 1. 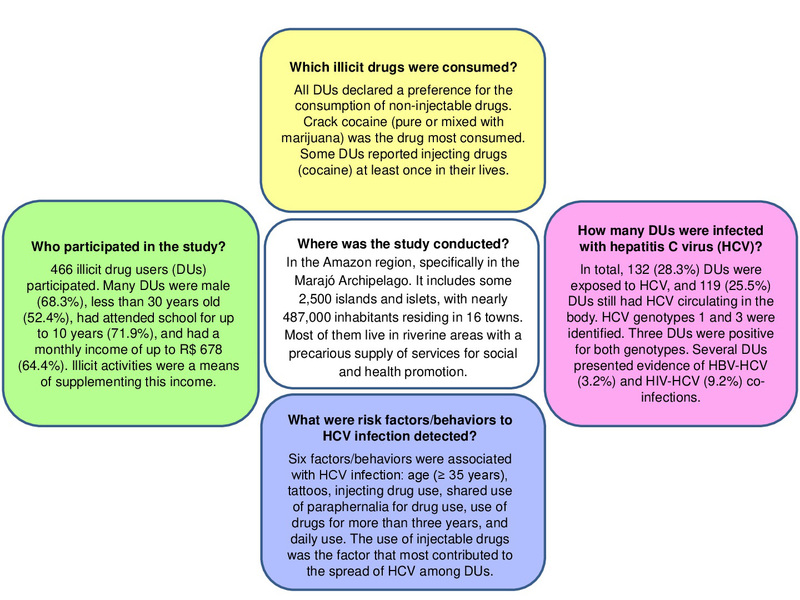 Relevant information on the epidemiological study of HCV infection among illicit drug users (DUs) in the Marajó Archipelago. The vast Amazon region is a relatively isolated and extremely diverse environment, in both biological and social terms, which has little infrastructure and mostly inadequate public services. One prominent scenario is the Marajó Archipelago, located in the estuary of the Amazon River. Based on this, an epidemiological study addressed 466 DUs detect the number of infected and the frequency of HCV genotypes, as well as to determine the factors associated with HCV infection among DUs in the Marajó Archipelago. Results show that a majority of DUs were young males, poor education, and low income. All subjects declared a preference for the consumption of non-injectable drugs, in particular crack cocaine. Most DUs declared having used other drugs at some time in their lives. Some DUs reported injecting drugs at least once in their lives, and more than half of these individuals were also involved in the local drug trade. In total, 132 (28.3%) DUs were exposed to HCV (positive results for anti-HCV antibodies), and 119 (25.5%) DUs still had HCV circulating in the body (positive results for HCV cDNA, a marker of active infection). Four DUs were identified with very recent HCV infection. Further testing detected the presence of hepatitis B virus (HBV) and human immunodeficiency virus (HIV) infections in DUs infected with HCV. Genotypes 1 (66.4%) and 3 (31.1%) were identified, and three DUs (2.5%) were positive for both HCV genotypes. The risk factors associated with HCV infection were: ≥ 35 years old, tattoos, intravenous drug use, shared use of injection equipment, and the daily and long-term use of illicit drugs (Fig. 1). This socioeconomic profile of DUs is typical of that of other Brazilian populations. However, most of the users of injectable drugs had a low income, and presumably acquired financial resources through illicit activities, during at least part of their lives, to support the purchase of drugs. This scenario would facilitate the spread of a number of pathogens to the general population and other vulnerable groups. The prevalence of HCV infections recorded was higher than that recorded in other Amazonian groups (blood donors, indigenous populations, and riverside communities). If no policy is established to control and prevent HCV infection, the transmission of HCV will tend to increase over time in this vulnerable population. The detection of very recent HCV infections and co-infections reflects this tendency, which may be further reinforced by other factors, such as the sporadic use of injectable drugs, and daily and long-term drug use, which have contributed significantly to the spread of HCV infection among DUs in the Marajó Archipelago, and possibly in the Amazon as a whole. These findings will contribute to the systematic understanding of the epidemiological scenario of HCV infection in the Amazon region, which is still so poorly known. Hepatitis C virus infection among illicit drug users in an archipelago of the Amazon.